The Athletic Department is hosting a free College Recruiting Night for interested junior and senior male and female athletes and their parents next Wednesday, September 12th at 7:00 in the Cafeteria. The evening should last about one hour. Topics will be discussed to help you make an informed college decision if you plan on being a student-athlete at the collegiate level. Tim McDonough ’91, Baseball Coach at Lewis University, will serve as the guest speaker for the evening. If you have any questions, about the evening, please contact the athletic office. Please sign up ahead of time here. If you have a 7th or 8th grader at home, please take a minute to fill out our sibling information form so that we can send them a St. Laurence t-shirt! Seniors and their Parents are invited to attend a Financial Aid Presentation and College Rep Panel to take place in the STL cafeteria on Monday, Sept. 24 at 6 pm. The Associate Director of the Office of Financial Aid at Saint Xavier University will explain how to complete the FAFSA (Free Application for Federal Student Aid). FAFSA is the form used to secure funds from the Federal government, state government, and individual colleges and universities and can be submitted beginning October 1. At 7:15 PM, the representatives from various schools will provide general information about their academic institution and college in general. Please contact Mrs. Kasboske at (708)45806900 X222 or akasboske@stlaurence.com to confirm how many people will be in attendance so a sufficient number of handouts will be available. Thursday, September 20, 2018 at 7 pm – Guest speaker Dr. Tom Pallardy discussing Social Emotional Issues and Anxiety; Club dues ($25 per club) due at meeting, all parents are required to join. Thursday, September 27, 2018 – See registration form here. Registration for Kairos 69 is now open. The spiritual retreat is open to only juniors and seniors. 15 male and 15 female students will be selected on a first come/first served basis, with priority given to students participating in activities that don’t allow them to attend other dates and seniors. You can find full details and the registration form here. The application deadline is October 10. We are now accepting applications for this year’s immersion trip to Lima, Peru. The trip will take place March 2-9 with an optional extension to visit Machu Picchu. Those interested should see Mr. Turney to receive an application. Application deadline is Friday, September 14. Take advantage of this once in a lifetime opportunity! Here are the winners of the August family raffle winners. Checks will be in the mail. 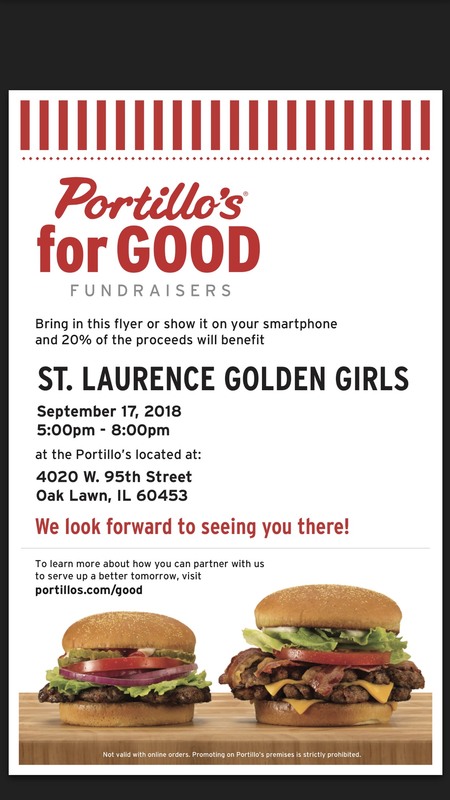 The St. Laurence Cheerleaders will have a fundraiser on September 17 from 5-8pm at the Portillo’s at 4020 W. 95th Street in Oak Lawn. 20% of all proceeds will benefit the Golden Girls. Simply show them this picture at the register.